Settled in at the Wildlife Institute of India, in the Guest House, in Dehradun. First morning after arrival, took an early morning bird walk while the family was sleeping. After breakfast, was reminded by Wildlife Science graduate student, Ms. Preeti, M.S., never to walk on the trails alone. Sensible advice. 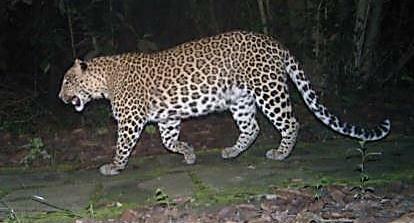 Game camera placed on trails near the Guest House captured this leopard photo just a few days ago! Leopards that eat people are the exceptions, as documented in well-known British hunter-turned-conservationist Jim Corbett’s Man Eaters of Kumaon, in which he tracked and killed a leopard that ate 114 people. 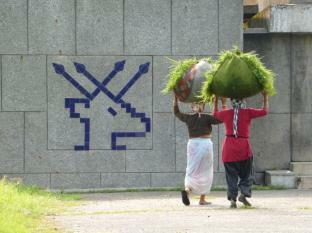 Hope that this leopard’s prey are deer, as in the stylized blue logo of the Wildlife Institute. This entry was posted in Fauna of India and tagged Dehradun, India, Jim Corbett, Kumaon, Man-eater, Man-Eaters of Kumaon, Uttarakhand, Wildlife Institute of India. Bookmark the permalink.